It is the "CursosHispanicos" from the University of Gran Canaria that offers various SpanishLanguage courses throughout the year. 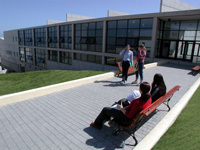 It is a young University but has beentraining foreign students in Spanish for several years now. Whilestudying Spanish at this University, you can at the same time enjoy the widerange of activities Las Palmas offers (sports like windsurfing,surfing, scuba diving, paddle, tennis, golf, etc., culture, gastronomy,beaches...). The coursesare all offered in small groups, divided according the levels. Students cansign up for courses from two weeks to one year, depending on the type ofcourse. Each course is divided into two weeks’ modules, so students can easilycombine different courses. This courseis offered throughout the year and is for University and non-Universitystudents (min. 17 years old). The two weeks course consist of 40 hours intotal, taught in the morning or afternoon – from Monday to Friday - dependingon the level of the student. Start dates: EveryMonday for all levels. ( Please do however contact us for availability). Classes areheld with one student only and it is the student who decides the contents ofthe course. This can be grammar, conversation, Spanish history, literature,art, etc. It is possible to enrol from 1 week to unlimited time. This coursecan be combined with any of the other courses offered by the University. This courseis offered to students and adults of 18 years and older who whish to obtain theuniversally recognised Diploma de Español como Lengua Extranjera (DELE) of the Institute of Cervantes. If you need accommodation in Gran Canaria (Canary Islands), please contact us for moreinformation and prices. Don’t forget to let us know the type of accommodationyou are looking for and for how long you wish to rent it.